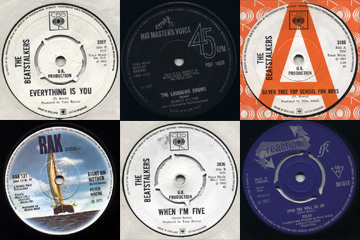 45RPM singles from the sixties and seventies…, originally uploaded by John Larkin. David Bowie turned 58 on the 8th January. It was Elvis Presley’s birthday too. Anyway, to celebrate Bowie’s birthday I dug up some old 45RPM singles by a number of different artists including the Beatstalkers, Ronnie Hilton, Peter Noone and Oscar. Bowie had written songs for all of these performers when he was still a struggling artist trying to make ends meet. See the single labels here.